After some prep from Shakugan no Shana S, Sakai Yuji and Shana are back for the ultimate plot twist and ending that will surely surprise you. What's in store for us in Shakugan no Shana III? WARNING: MAY CONTAIN SPOILERS. READ AT YOUR OWN RISK. Once again, the art is perfect and the battles are even more fierce this time around. We see an all-out battle between the Flame Hazes and the Denizens towards to end of the series. Shana is back more 'flamier' than ever with her flowing red hair. Sparkly. Yuji also had a makeover so I was confused at first but came to understood what happened to him. Otherwise, the other characters were pretty much the same as the two other prequels. 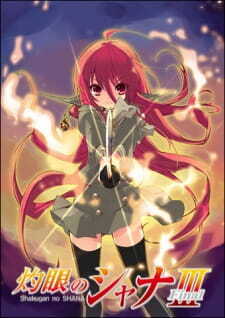 I totally loved the opening and ending theme songs of Shakugan no Shana III! The opening song had some nice beats and rock elements to it which totally suited the mood. I would also like to mention that the first opening song was written by ryo of supercell! The soundtrack was also appropriate and suited the anime perfectly. Voice acting was of course the same as ever but with Yuji's makeover it took a little bit of time to get used to. The series does also present quite a few new characters that we haven't encountered before, mainly some Crimson Lords and notable Flame Hazes. Along with the original cast we have quite a collection here. As such, most of the characters were not that memorable apart from the original cast. The character development for these new characters was pretty weak so that also contributed to the lack of understanding and depth of the characters. Margery Daw and Wilhelmina were still my favourite characters once again although Sabrac was awesome! That guy is pretty much undefeatable no matter how much attacks you throw at him, he just gets up. In the end, he was willing to sacrifice himself after having a epiphany. The other Denizens in the end leave for the new world along with many Flame Hazes. Overall, I really enjoyed the anime from start to finish. The ending was how I liked it and the story kept me going and going. I am glad that most questions were answered and plot holes covered. This has been one engaging anime to watch and I definitely recommended it to another who likes sci-fi, action and super powers. Oh, and also those tsundere loving types like me. Perfect ending how I wanted it to be. The story was engaging right from the start. Well illustrated much like the two prequels. Catchy theme songs! Also the voice acting was excellent as always. More and more characters seem to pop out of nowhere. Definitely a well made ending to the trilogy. After watching the prequels I have to say that I am satisfied with this anime series.